Crunchy on the outside and chewy in the middle, a good coconut macaroon is an irresistible thing. They are also suitable for freezing. 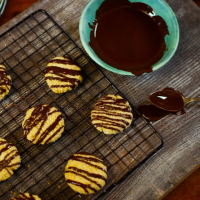 To pimp them up, dip or drizzle the baked macaroons with melted dark chocolate. 1. Preheat the oven to 150°C (130°C fan). Line 2 baking trays with parchment paper. 2. Using a hand-held electric mixer, whisk the egg whites in a bowl until stiff peaks form. Lightly fold in the icing sugar. Gently stir in the ground almonds, almond extract and desiccated coconut until the mixture forms a sticky dough. 3. Spoon heaped tablespoons of the mixture on to the lined baking trays, and shape into round mounds. Sprinkle a little shredded coconut on top of each one. 4. Bake for 25 minutes: the outer crust should be light golden but the inside needs to be nice and soft. Leave to cool on the baking trays for 1 minute and then transfer to a wire rack and leave to cool completely. Drizzle with dark chocolate and allow to set before eating.